Yuan, S., Das, S., Ramesh, R. and Qiao, C., “Analysis of the Cloud Contract Trifecta: Backup Resources, Price and Penalty in the Availability-Aware Cloud,” Forthcoming at Information Systems Research. Yang, Z., Liu, L., Das, S., Ramesh, R., Du, A.Y. and Qiao, C., “Availability-aware Energy-efficient Virtual Machine Placement Algorithms,” Journal of Communications – Special Issue on “Frontiers of Computing and Communications”, September 2015, 10(9). Du, A.Y., Das, S., Yang, Z., Qiao, C. and Ramesh, R., “Predicting Transient Downtime in Virtual Server Systems: An Efficient Sample Path Randomization Approach,” IEEE Transactions on Computers, December 2015, 64(12). Du, A.Y., Das, S. and Ramesh, R., Efficient Risk Hedging by Dynamic Forward Pricing: A Study in Cloud Computing, INFORMS Journal on Computing, Fall 2013, 25(4). Chai, S., Das, S. and Rao, H.R., “Factors Affecting Bloggers’ Knowledge Sharing on Social Networking Websites: A Socio-Technical Approach,” Journal of Management Information Systems, Winter 2011 – 2012, 28(3), pp. 309-341. Das, S., Du, A.Y., Gopal, R. and Ramesh, R., "Risk Management and Optimal Pricing in Online Storage Grids," Information Systems Research, December 2011, 22(4), pp. 756-773. Bapna, R. Das, S., Day, R., Garfinkel, R. and Stallaert, J., "A Clock-and-Offer Auction Market for Grid Resource When Bidders Face Stochastic Computational Needs," INFORMS Journal on Computing, Fall 2011, 23(4), pp. 630-647. Du, A.Y., Das, S., Gopal, R.D. and Ramesh, R., "Risk Hedging in Storage Grid Markets: Do Options Add Value to Forwards?" ACM Transactions on Management Information Systems, June 2011, 2(2). Bapna, R., Das, S., Garfinkel, R. and Stallaert, J., "A Market Design for Grid Computing," INFORMS Journal on Computing, Winter 2008, 20(1), pp. 100-111. Das, S., "Timing Movie Release on the Internet in the Context of Piracy," Journal of Organizational Computing and Electronic Commerce, October - December 2008, 18(4), pp. 307-332. UB's Exceptional Scholar - Young Investigator Award 2012. Associate Editor, Information Systems Research. January 2016 – Present. Associate Editor, INFORMS Journal on Computing. December 2013 – March 2017. Coordinating Editor, Information Systems Frontiers, January 2008 – present. Co-Chair, Conference on Information Systems and Technology, CIST 2014, San Francisco. Co-Principal Investigator on a research project “Providing Reliable Cloud Services Through Availability-aware SLA Contract Designs”, funded by Huawei Technologies. December 2015. Award amount: $225,000. Co-PI on the research project “An Analytical Approach to Quantifying Availability (AQUA) for Cloud Resource Provisioning and Allocation" funded by the National Science Foundation (NSF) (2014-16). Award amount: $400,000. Co-Associate Director of the Computational Data Enabled Science and Engineering (CDSE) Program, (October 2016 – present). 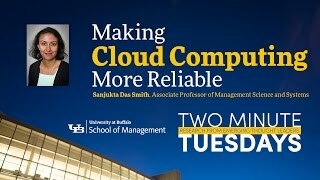 Sanjukta Das Smith on how to make cloud computing more reliable (co-authored with Anna Ye Du, Chunming Qiao, R. Ramesh and Zhouhan Yang).